The man known as Second Ptolemy would utilize a copy of his namesakes writings and a little help from a physician named Galen to create the science of optics. Galen, for the record, was a student of Aristotle, though not directly, who spend a good deal of time understanding the human eye. Personally, I would liken Alhacen more to a Second Aristotle. He was a master teacher and analyst. Alhacen�s work would be published in the Book of Optics. This, as often the case, was translated into Latin in the 12th Century as Perspectiva. This work would be the inspiration for dozens of later scientists and inventors. This publication by Mark Smith examines some of those original writings and models. It is a great opportunity to understand the history of this great science. The ancient world provided us with two competing models for the theory of optics. While ultimately not the more accurate, Ptolemy's model would prove very influential in the decades and centuries to come. Ptolemy's theory would become a corner stone for the coming science of optics. 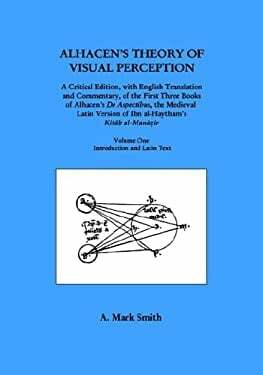 This book by Mark Smith, draws upon Ptolemy's original writings to provide history and perspective on this ancient polymath. Tufte is the grand master of data visualization and this book is his most classic work. It is a must read for anyone engaged in data visualization, design, or business intelligence. That is not to say the Tufte has gotten it all right... This book is foundational. Understand this visualization guru and his methodology first and then build your knowledge of newer methods and theories.